THE Sharjah Investment and Development Authority (Shurooq) is keen to start implementing its new strategy for 2013, which focuses on development of cruise tourism in the emirate of Sharjah, UAE. Shurooq has set out a range of various measures and programmes to be carried out in sequence with a particular focus on Khorfakkan port as well as other Sharjah ports. According to the new strategy, Shurooq will develop the cruise liner sector in Sharjah to attract the world’s largest cruise ships to the emirate’s ports, collaborate with renowned cruise ship operators to include Sharjah’s ports among the main preferred tourist destinations and arrange a number of programmes and activities for cruise tourists. The authority, together with a number of specialised international agencies, is currently preparing a comprehensive study to identity the requirements and find the best instruments to develop and support this industry. Al Sarkal said that the cruise ship sector is increasingly attracting tourists, especially families, from all over the world, offering them a unique multi-destination experience. Therefore, Shurooq is coordinating with concerned parties to provide all the necessary facilities to support this sector, attract more cruise ships and tourists to the emirate, and offer varied tourist packages that cater to their needs. 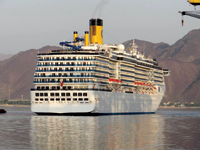 Khorfakkan Port is receiving two cruise ships weekly, namely Costa Atlantica and Costa Classica, which dock in Sharjah’s ports, in collaboration with the Sharjah Commerce and Tourism Development Authority, the Department of Seaports and Customs – Sharjah Customs, and the General Directorate of Residency and Foreigners Affairs in Sharjah. Shurooq is seeking to host more major international cruise liners, in line with its eagerness to develop the tourism sector, in general, through a range of tourism projects and initiatives in the Eastern Region, most notably is The Chedi Khorfakkan Resort, the Kalba Eco-tourism project, Al Hisn Island in Dibba Al Hisn, and Al Montazah among many more development projects across the emirate of Sharjah. The Authority has also recently launched the City Sightseeing Sharjah Tour Bus and Seaplane among many other tourism programmes.